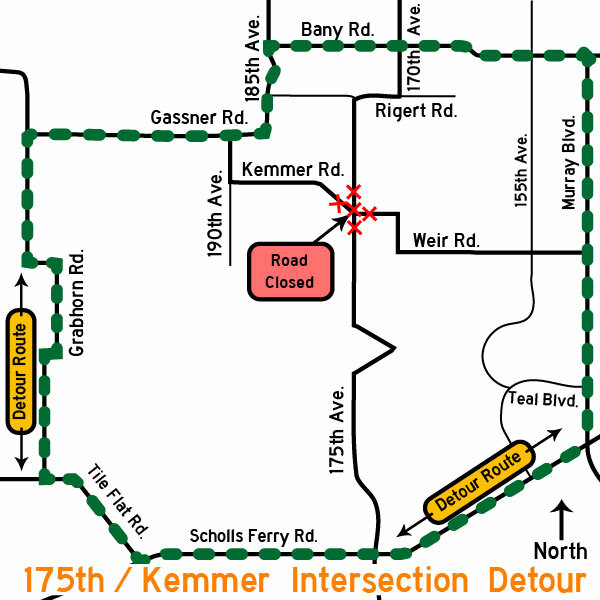 The 175th Avenue/Kemmer Road intersection will close Oct. 29-Nov. 13 for construction of a roundabout. All travelers are asked to use Grabhorn Road or Murray Boulevard (see map). The roundabout is expected to open to traffic Nov. 13. For more information, visit the project page or contact Washington County Department of Land Use & Transportation at lutproj@co.washington.or.us or 503-846-7800. For the latest road construction schedules, visit www.wc-roads.com.